At Tupelo Honey Cafe, we’re dedicated to marrying Southern tradition & ingenuity with vibrant, refashioned flavors. We currently serve two locations in Asheville, NC. A third Tupelo Honey Cafe opens this month in Knoxville, TN and an additional location is slated to open in fall of 2013 in Johnson City, TN! With the holiday season fast approaching, we’d love to see what fantastic festive fare you can come up with! The Holiday Recipe Contest runs from October 1st through November 16th, and all entries will be judged by Chef Brian Sonoskus and his hungry team of taste-testers! The three winners will be announced on December 3rd, each receiving a $200 gift card to be used at the Tupelo Honey Cafe Online Store, or at one of our restaurants. 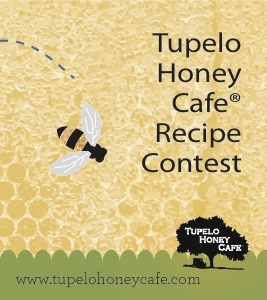 Each week during the contest a drawing will also be held where one lucky participant will win a copy of our cookbook: Tupelo Honey Cafe: Spirited Recipes from Asheville's New South Kitchen. We can’t wait to see what delicious holiday helpings you’ve shared with us!